You are the very definition of a dedicated athlete. When you train, you train hard. But sometimes, it’s the stuff you can’t control that holds you back…like a slow metabolism. Isomer CIS-9 helps speed up your metabolism so you can isolate stubborn body fat. It would be pretty sweet if you burned calories as fast as you burned through reps, right? When you increase your muscle mass, you will…because muscle burns fat. So, the next time you’re in the gym, know that with ISO-CLA you’ve got a secret weapon on your side. Isomer CIS-10 increases your metabolic rate giving you the power you need to shed off those last few pounds of fat. Achieve the sculpted, chiseled body you were born to have with the power of Conjugated Linoleic Acid. A one-of-a-kind, real powerful fat-scorching ingredient. All you do is win, win, win no matter what. The area you want to win most in? Body composition. Get the perfect ratio of fat mass to lean muscle mass in 2 steps. The first, you’ve already got covered: go hard in the gym. Second, commit to a solid fat-mobilizer – ISO-CLA. ISO-CLA helps you lose fat without the use of stimulants. If you ask us, that’s the right way to do it – without getting wired up. ISO-CLA can be taken at any time of the day and rest assured, it won’t keep you up at night. Our formula is 100% stimulant-free. 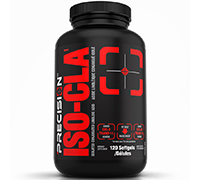 How is ISO-CLA different from other CLA supplements on the market? ISO-CLA is a powerhouse of fat-burning ingredients. Included are both Isomer Cis 9 and Isomer Cis 10. Essentially, we’ve isolated the two CLA polymers that help increase metabolism and fat burning potential. So, you get all the muscle building and fat melting power you need to be a champion x 2. Another thing – we know you have a routine that you’re committed to. That dedication is how you got to be where you are today. ISO-CLA won’t mess that up. It’s completely stimulant free so that you burn fat without any jitters or sleepless nights. We know that you’re a committed athlete who doesn’t cut corners – you want your gains to come from hard work and hard work alone. Integrity is just as important to us. That’s why all of our supplements are manufactured in a Health Canada site-licensed facility that is 100% free of banned substances. We also rigorously test each of our products to ensure supreme quality – always safe, always powerful. ISO-CLA is safe for adults above the age of 18.